We’ve opened up our project management tools to all service providers and CROs. These tools are no longer limited to providers offering sequencing services. 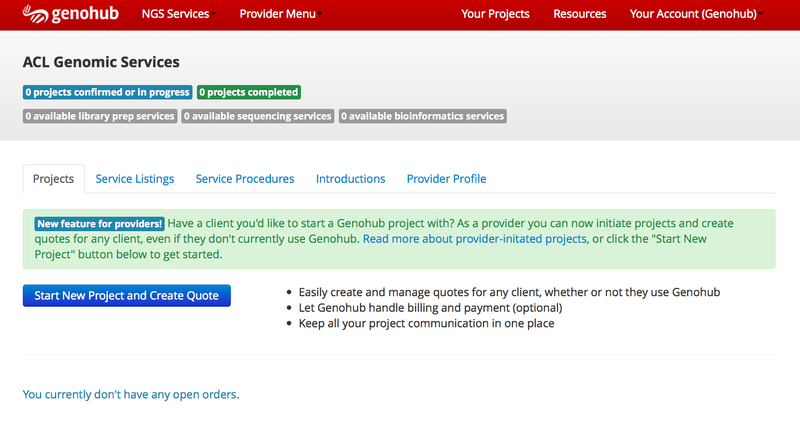 If you offer any type of scientific service, you can now use Genohub software to initiate projects, write quotes and manage back and forth project communication at no charge. In the past, a researcher would have to inquire about your services before you could start a project. Providers can now start projects and quotes for researchers anywhere in the world. You’re a service provider who handles internal service projects from researchers within your University. You’re tired of using email threads to manage these projects and are looking for a way to send quotes, have researchers upload project specs and have all back and forth communication saved as part of a unique project. Genohub’s PIP feature handles all of that and is available free of charge! A new researcher or someone you’ve worked with in the past contacts you to start a service project. Using PIP you can initiate a project, write a quote and manage communication with anyone in the world. We’ll only charge you if you elect Genohub to handle invoicing and billing, otherwise it’s free. To get started, use the blue ‘Start New Project and Create Quote’ button on your Project Dashboard to initiate a project.